This was just what I needed to read after two more serious books. 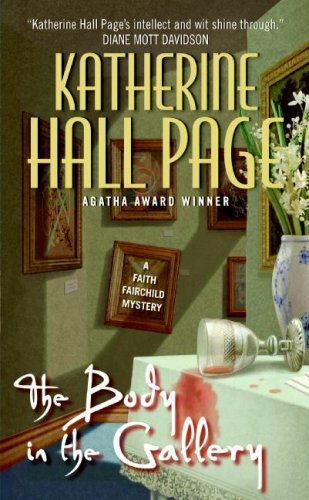 Faith is one of my favourite sleuths. The author tackles an issue faced by teens growing up, as well as the issue of a working mom. So, all in all, it was also a serious book, but had its light moments as well. This book is now on its way to someone who chose it out of a VBB I was participating in. Enjoy! Yay! book arrived today. It looks like a book I will enjoy and I am happy with my choice. I chose this in the First sentence VBB. The first sentence is 'Wait, let me get this straight. Isn't what you're suggesting called breaking and entering?'. Thanks loveamystery for this book! Her investigation takes Faith into Boston's art scene and historic Beacon Hill, as well as into the lives behind the façade of the Ganley's very proper board of trustees. She is at her wit's—and almost dead—end, as the killer strikes again, and again. This is the first book I have read in this series. I enjoyed it and would like to read more about Faith Fairchild. Included in the book are some recipes such as Chicken Stroganoff and Red Velvet Cake. I will post this today to mafarrimond, who chose it in my 200 wild releases RABCK. The book has arrived safely and I think I will enjoy this. THank you.